Of all the companies that might put out a restricted network whitepaper (PBMs, retail chains, consultants), I will admit that Wal-Mart is a surprise to me. It’s not that they haven’t been trying different strategies to increase market share – $4 generics, direct-to-employer contracting, but in general, I don’t see them doing a lot of marketing or selling in this space. They participate at one industry event, but their booth is very stark compared to other pharmacies. But, that being said, the whitepaper makes the key points that anyone would make (i.e., I agree with the framing of the opportunity) with a slight twist of focusing on member savings versus payer savings. You should treat pharmacy negotiations like buying any widget. There is more supply than demand. Today’s model encourages all pharmacies to offer a rate that doesn’t get them kicked out of the network. Today’s model doesn’t encourage consumers to pick one pharmacy over another. There’s 5x more pharmacies than McDonald’s in the US…and no one would argue that it’s difficult to get a Big Mac. They quote the Medicare pharmacy access standards to make the point about what access you can survive with. They reference an Express Scripts analysis that says the Medicare access standard can be achieved with a national network of less than 20,000 retail pharmacies (compared to the 60,000 in most networks). With the integration of CVS Caremark and their offer of Maintenance Choice, we’ve obviously seen the focus on this increase. And, the recent public negotiations with Walgreens highlighted that this is seen as a viable model for the future. How small will the network be – regionally, nationally? Who do you build the network around – CVS, Walgreens? What does this mean for mail order? What rates do the retailers have to match to participate? Does the network start to look like a formulary where you have preferred pharmacies at one copay and non-preferred at another copay or is it either in-network or out-of-network? Does this increase or decrease power for the independents that have to be in certain places? Will anyone really test the national access standards and go to a 20,000 store network? What will consumers say and do? Does this accelerate adoption of cash cards and cash business for generics? But, again, I struggle to see Wal-Mart as the chain that you build around unless the whitepaper is a thinly veiled attempt to push the direct-to-employer model (i.e., Caterpillar) which has saved the employer lots of money, but isn’t a simple to implement program (IMHO). 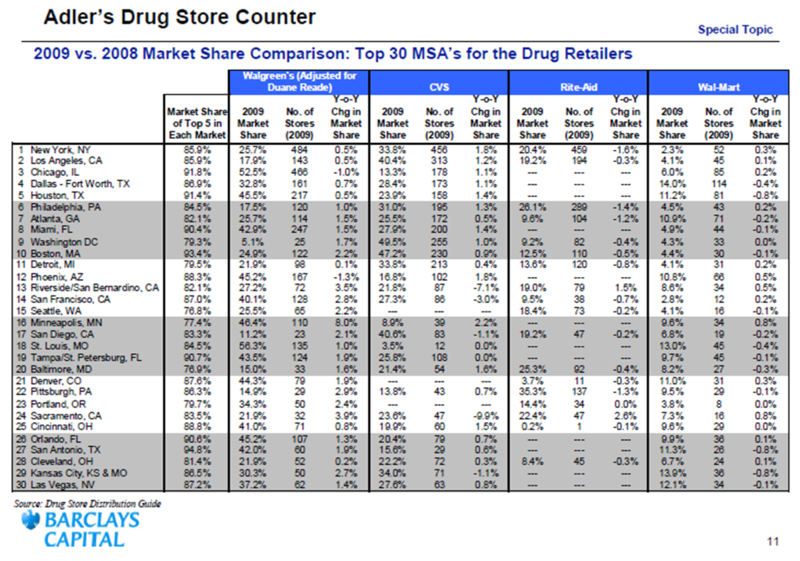 Here are some marketshare numbers for Walgreens, CVS, Rite-Aid, and Wal-Mart for the top 30 MSAs. Only 9 of those markets have Wal-Mart share above 10% and none are higher than 14%. For the other three, you have markets where they have a much higher concentration around which you can build. Someone was asking me the other day if I saw the PBMs essentially partnering up. I’m not sure I do since there are markets where you would want to build a limited network with Walgreens and markets where you would want to build a limited network with CVS. At least for now, I don’t see Medco and Express Scripts just picking one dance partner although they might just based on who’s willing to play with them. The other thing that becomes important here (tying this back to my Silverlink work) is communications. You have to identify who will be affected in moving to a limited network. You have to communicate with those people and help get them to the preferred pharmacy. You have to help them understand why you are doing this (savings) and WIIFM (what’s in it for me). It creates some great dialog between the head of benefits and the CFO. We can save $X…BUT we will have to ask Y% of our employees and their families. Will they care? Do they know their pharmacist (unlikely)? Will it be an issue of convenience? 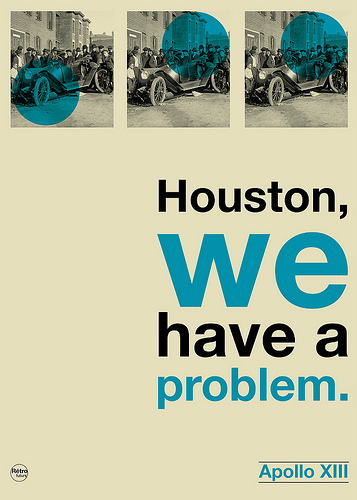 Will they complain (of course…change is hard)? Will they ultimately care (unlikely as most disruption becomes accepted after 3-6 months)? 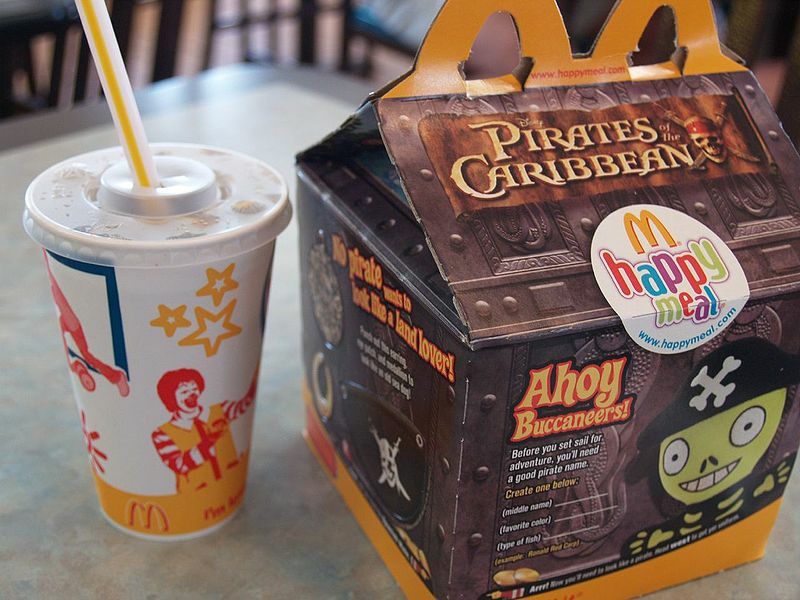 Should Restaurants Use Characters To Promote Unhealthy Foods? I find this to be an interesting debate similar to should companies be able to promote smoking. On the one hand, kids are obviously motivated to go to a fast food restaurant to get the latest toy that comes with the kids meal. On the other hand, they can’t do it unless their parents take them there. Additionally, you have to think about what the consumption of these fast foods are by the general population to understand if kids are eating the food at a higher rate than their parents. I’m not sure you could look at families versus couples because by the nature of families being busier and more scheduled they are less likely to eat prepared meals at home. These high level issues are important because if kids are likely to eat the meals anyways than why not give them a free toy because you are essentially using marketing to get them to choose one restaurant over another based on the toy. If it is the toy that is changing their eating habits then we have a different issue – commercials, over-scheduling, parental control, access to healthy meals and snacks, and general eating habits of the population. I struggle with the argument that the companies themselves shouldn’t be allowed to advertise. But, I do think there is comparative research which has been done on tobacco and alcohol advertising (i.e., the Marlboro Man). Even with that data, 47% of the child-marketing budgets for fruits and vegetables are on licensed characters compared to 29% of the dairy budgets, 15% of the junk food budgets, and 7% of the candy and ice cream budgets. In today’s Drug Benefit News, I was quoted several times on the issue of incentives and adherence. Here’s one of the quotes along with one of the quotes from Bob Nease from Express Scripts. “Some plans will do whatever it takes to get patients to be adherent to their therapy or engaged in better behaviors,” Bob Nease, Ph.D., chief scientist and vice president of marketing at Express Scripts, Inc., tells DBN. While the PBM hasn’t launched its own program yet, Nease says it will be following the trend closely. “The use of lotteries is very interesting and it has potential,” he adds. Don’t Take OTC Drugs (Cold Medicine) and Drive? Why don’t we all just stay home or set up a massive public transportation system across the US. Since over 50% of consumers take a maintenance drug, I can only imagine the percentage of people who take either a maintenance prescription drug or an over-the-counter (OTC) medication. And, now the government wants to issue a warning about driving while taking medication and throw that in the same bucket as illegal drugs, driving drunk, and texting while driving. Do they have any studies here? Don’t medications that make you drowsy require labeling (not that anyone reads it or follows it)? I guess I’m just confused at someone coming out and making broad statements like this. Washington (CNN) — Add driving while on drugs — even it’s just cold medicine — to the list of distractions behind the wheel to which authorities are giving special attention. National Drug Control Policy Director Gil Kerlikowske, a former police chief in Seattle, said drivers need to know they might be impaired if they have taken prescription or over-the-counter drugs, just as with illegal drugs. “Drugs adversely affect driver judgment, driver reaction time, their motor skills and their memory,” said Kerlikowske, telling reporters the effects can be similar to those of driving under the influence of alcohol. 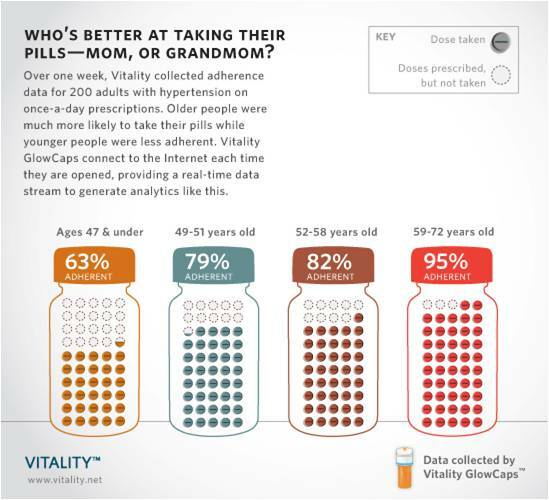 Does Age Matter in Adherence? 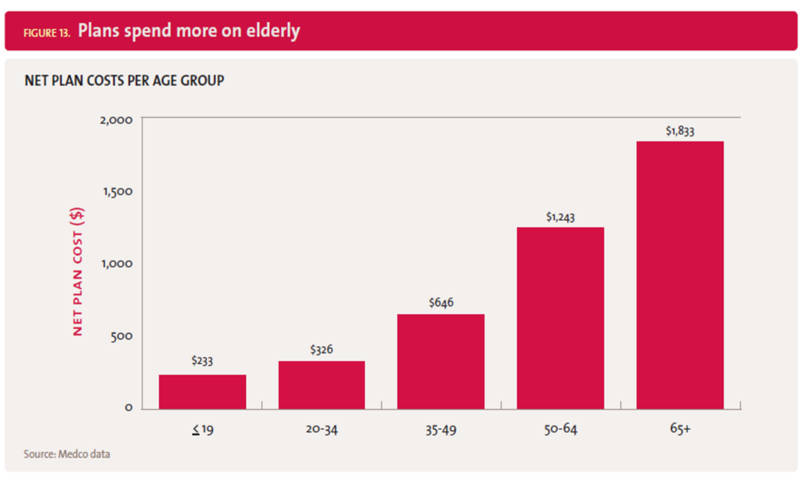 Certainly age could be a confounding factor for many reasons – health literacy, length with a condition, co-morbidities, number of medications, tolerance for side effects – but I like this chart that the people at Vitality (aka GlowCaps) (www.rxvitality.com or www.roseology.com) just put out. Of course, I’d love to know their MPR (medication possession ratio) before using the device. Which had the higher lift? I get lots of press releases or opportunities to speak with people sent to me. Ashley sent me a request to post an entry on my blog. I gave her a topic that I thought would be interesting, and she followed up with a story. Here it is. We’ve all seen and interacted with pharmacy technicians more than a few times; they’re the people in the drug store who fill out your prescription and work behind the scenes at the pharmacy. Because certification is not a necessity in a few states, some pharmacy technicians are able to gain employment based on their experience or willingness to learn quickly on the job. They work under a licensed pharmacist and are not allowed to advise patients regarding their medication or any other aspect. But more often than not, they do interact with patients and offer solicited advice and answer any question they’re asked. It’s no big deal as far as the patient is concerned, unless of course, something goes drastically wrong. If there’s a mix-up with the drugs or if a dispute arises as to the nature of advice given (the patient may misunderstand what the technician says, disregard any words of caution given, or just be careless in following instructions), then the fat is in the fire. And if the pharmacy technician in question is not certified, the problem magnifies exponentially. Pharmacy technicians must be certified because although experience does count, it is more valuable when built up on the foundation of education and the certification process which teaches them the right way to do things. Certified pharmacy techs have an advantage in that they are aware of the legal ramifications of their job and are able to act accordingly when it comes to dealing with patients in the absence (or presence) of a licensed pharmacist. Also, if anything goes wrong and a patient sues the pharmacy, certification helps to prove the credibility of the technician and holds more water in a court of law. Also, in some states, even though certification is not really necessary to work as a pharmacy tech, there must be one certified technician on duty in the absence of a licensed pharmacist. Although there are only a few states that require pharmacy technicians to be certified, others will be soon following suit because employers are increasingly looking to hire only techs that are certified and because it’s easier to standardize the quality of patient care provided at pharmacies when all the employees are certified by an accrediting board. As of now, Louisiana, Wyoming, Utah, Virginia, New Mexico and Texas require pharmacy techs to be satisfied. Illinois and Florida will soon pass requirements for certification within the next year. And Kansas, Georgia, Maine, North Carolina and Tennessee require the presence of at least one certified technician if there are more than three or four pharmacy techs at work. To become a certified pharmacy technician in the USA, you must have a high school diploma, GED or a foreign equivalent, and clear the examination administered online by the Institute of Certification of Pharmacy Technicians (ICPT) or the Pharmacy Technician Certification Board (PTCB). The ICPT offers the ExCPT exam while the PTCB allows you to take the Pharmacy Technician Certification Exam (PTCE), the only pharmacy tech exam endorsed by the American Pharmacists Association. You must complete 20 hours of continuing education every two years to keep your pharmacy technician certification status, and at least one of those hours must be in pharmacy law. Also, you are disqualified from certification if you have any felony or drug-related convictions or are under any restrictions from your State Board of Pharmacy. This article is contributed by Ashley M. Jones, who regularly writes on the subject of Online Pharmacy Technician Certification. She invites your questions, comments at her email address: ashleym.jones643@gmail.com. While the male family member has not traditionally been the dominant healthcare figure, will that change over time? There are 66M fathers in the US. 7 of the top 15 TV dads come from programs in the 50s and 60s (does that tell us something?). 1 in 4 dads spend less than an hour a day with their kids. 38% of working dads say they’d take a pay cut for more time with their kids. 13% of US companies offer paid maternity leave. There are at least 2M father-son businesses in the US. 10% of the 29M ties sold per year are for Father’s Day…but they are still the least-popular Father’s Day gift (just 1% give ties). Consumers spent an average of $91 on Father’s Day in 2009. We know that our friends drive our health…we exercise if our friends exercise…we lose weight if our friends lose weight. I’ve never seen a study comparing “friends” versus family in terms of social influence around healthcare. But, I certainly believe that you build a culture of health at home. Parents are important in doing that. What you eat. If you exercise. I’ve tried to stay out of this since my initial posts on this, but it has certainly added some excitement to the industry over the past couple of weeks. I can’t remember one topic stirring so many reporters, analysts, sales people, and other potentially affected constituents. 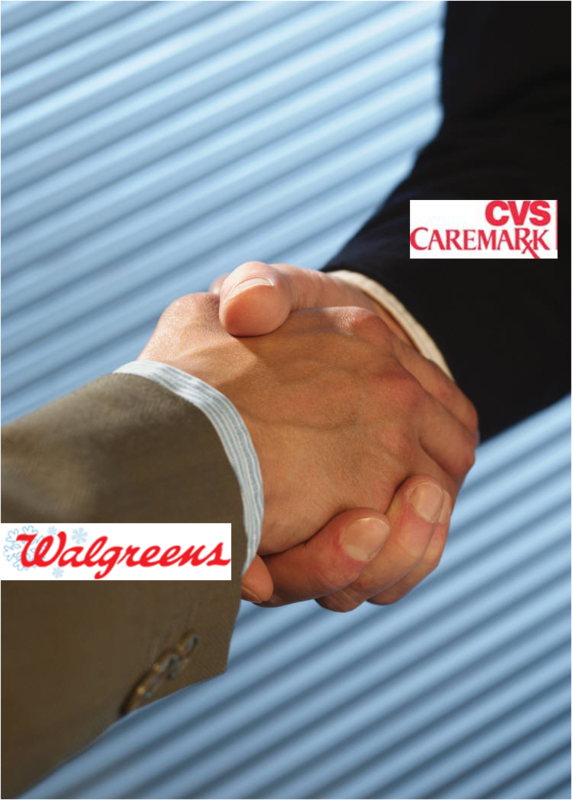 As I’ve predicted from the beginning, both CVS Caremark and Walgreens came to resolution. It was in their mutual interest. I know there are a few sales people at the other PBMs that are disappointed as they hoped for this to be a wedge in several open RFPs. I think it may actually work against the other PBMs depending on the terms. We know that Walgreens wanted higher reimbursement rates that other pharmacies. My question is whether they were acting like the UAW with the Big 3 auto companies. The UAW would reach agreement with two of them and then strike the 3rd one. Did the other PBMs give Walgreens higher reimbursement rates and then CVS Caremark finally draw the line in the sand? If so, does CVS Caremark have better rates and will they be even more aggressive around pricing in the sales cycle this year? On the other hand, I know people at the other PBMs that were hoping for either a validation of the limited network concepts that have been around forever with limited adoption or to see them come to terms and hope that they can draw a line in the sand similar to CVS Caremark. For those outside the two companies, it was a win-win scenario while it was a lose-lose scenario for the two players if they didn’t reach resolution. Will there be a Maintenance Choice offering with Walgreens in the network for 90-day scripts? I’m not sure here. Retailers have always struggled to over mail reimbursement rates at retail especially with less foot traffic, but I have to imagine that CVS and Walgreens have similar buying power. Does this validate the concept of a retailer owned PBM (which as I’ve pointed out before is not unique to CVS)? I’ve talked many times about my support of this concept and think it’s only those with something to gain who are keeping this concept an issue. The independent pharmacies who are losing to mostly chains but also mail and the other big PBMs especially Express Scripts that had made a bid for Caremark before CVS bought them. Adherence is the big focus these days. 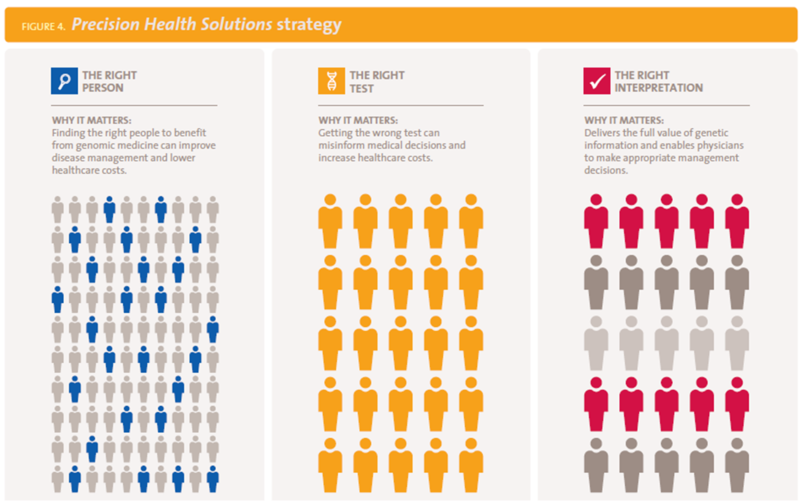 It’s an issue where everyone is aligned – payer, pharmacy, PBM, pharma, patient, MD. And, there are certainly lots of savings to be gained both hard dollars (less ER visits) and soft dollars (less absenteeism). There are lots of issues around adherence. Getting people to fill the script after they leave the doctor’s office. Making the script affordable. Getting them to take the medication. Remembering to take it over time. Dealing with side effects. Dealing with differences in cultures, conditions, health literacy, etc. Now, people are paying you or giving you a chance to “win” money every day just for taking your medication (see NYT article). So, in my mind, this eliminates the issues of affordability (i.e., you already have the drug) and side effects (i.e., you’re not going to take something that has a meaningful side effect just for money). So, why do I have to pay you. Does the dentist pay you to brush your teeth? Of course not. Does your auto insurance company pay you not to speed? Does your life insurance company pay you to not drive drunk? NO…In all these cases you either pay more money if you do this or your service gets discounted if you don’t. If you have a chronic illness, can afford the medication, and have no meaningful reason to not take it, you should be doing your best to take the medication. Otherwise, you’re driving up the costs of healthcare for you and your friends and your kids. You do have some social responsibility to try and get better OR you should pay more for your healthcare. We all have a choice (see the 1,000 pound woman). Won’t paying people just create a long-term “dependency” where I only want to take my pills when I’m getting paid? Probably…we certainly used to see that incentives at the call center drove up success rates, but once they went away the success fell below the baseline. For the people that are adherent, will you just be wasting money? Yes…and why should my neighbor get paid for forgetting…I’m going to want the same thing. Don’t get me wrong. I’m a fan of incentives, but reward me for the right things otherwise we end up with situations like Enron. Incent me for managing my BMI, my A1c value, my blood pressure. I can take medication, work out, or diet to achieve those. Give me tools and information. Help me to understand my drug. Help me to afford my drug (e.g., value based insurance design or patient assistance programs). Educate me on my condition. Have a talking pillbox or medication bottle. Call me to remind me to refill. Sign me up for auto-refill. I just can’t get on board with this latest twist. I guess the proof is in the pudding so we’ll see if it makes a difference. I’d love to be proven wrong here and see us throw money at people and change the healthcare cost curve. I was reading about a great idea this morning in our local county paper – “Sensory Friendly Films”. This is an idea for families affected by autism or other conditions so that they can take their kids to the movies. Apparently, our local movie theater (AMC West Olive 16) has partnered up (at the corporate AMC level) with the Autism Society to design this program. The movies are shown with the lights turned up and the sound turned down. There are no previews. Families can bring their own snacks. And, kids are able to move around and talk during the movie if needed. There are an estimated 30M people in the world (1.5M in the US) with an autism spectrum disorder. If you haven’t read the article in USA Today titled “A doctor’s request: Please don’t ‘friend’ me“, I think you should. It makes some great points and is symbolic of the challenge we all face relative to social media. 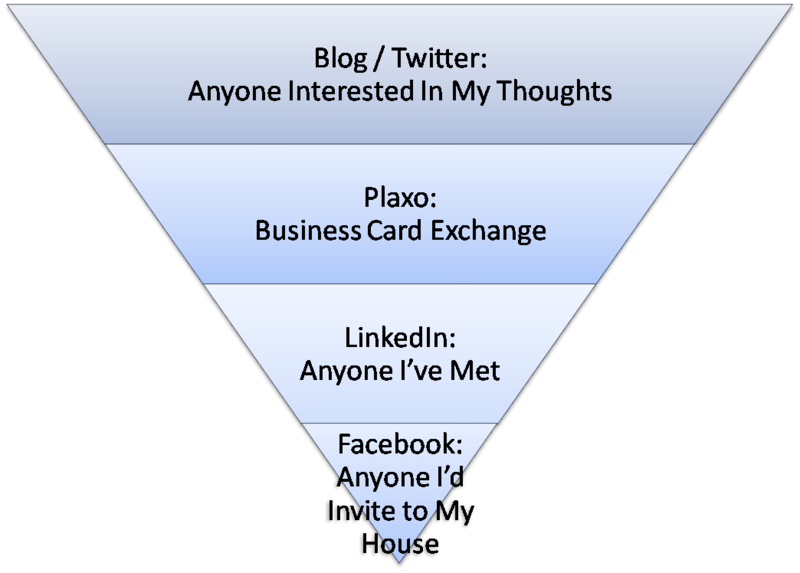 Which tools should we use – MySpace, Facebook, Twitter, LinkedIn, Plaxo, blogging, …? How much time to spend on them? What should I expect from them – leads, contacts, friends, finding old friends? Is this okay to do at work or should I do this at home? Should these sites be blocked at work? What can I or can’t I say? Should I accept invitations from everyone who reaches out to me? The author of this article talks about some of the more physician specific issues of becoming friends with your patients in Facebook, but it generally begs the question of where do those boundaries exist. On the flipside, what if a friend of yours is a physician and you need to be treated. Is that okay? I think so. I know my pharmacist very well. We’ve even had her and her family over to the house several times. But, we became friends through our kids and our gym not simply because we have a clinical relationship. And, while we’ll talk industry trends occassionally, we rarely talk specifics. Plus, the fact that I help lots of companies drive business away from her pharmacy (retail-to-mail) never sits too well! So, I’ve selectively added social media sites over the years. Here’s a quick picture of how I think about it. I do not accept the majority of invitations that I receive simply based on a few key criteria which vary by tool. For example, in Facebook, I generally have to view you as someone who I have or would invite to my house in order to be your friend. In LinkedIn, I have to have connected with you in person or on the phone one or more times before I would become a connection. I’m not sure how else to describe this woman who willingly wants to weigh 1,000 pounds so she can hold a world record. She’ll be so unhealthy. I at first assumed that she must not have kids since this is essentially suicide…but she does. I wonder if this is a reason to remove someone from health insurance or life insurance. If she needed an ambulance, I’m not even sure how they would get her out of the house. She’s already over 600 pounds. I was at the AHIP conference in Las Vegas and was thinking from a human behavior perspective how interesting this location is as a “study environment” (not to mention the concept of conferences in general). Why do people gamble? Do they think they’ll win? Do they think it’s fun? How do people choose which game to play – poker, blackjack, slots? Penny slots versus dollar slots? Is it based on total opportunity, perceived odds, advice, research? Are people more likely to smoke here? More likely to drink here? More likely to stay up late? Does this encourage an ADHD “culture”? Is poker a “sport” or somehow different from games of chance? I think poker gives you an additional insight into human behavior since you’re playing against a seemingly random group of people (who in my experience often tend to know each other) rather than chance or a dealer who is following specific rules. How do you read people to know what they have and when to bet? Why do people try to bluff? Why do people believe they’ll get lucky and hit the one card they need? Why do people only remember their big wins not their big losses? How do you build “predictive models” internally that you process on the fly to make calculated bets? Why are some people good at poker? What recession? This place is packed. How do all these people have all this money? Why do I think I might win? Look at the size of this place…It’s certainly not a non-profit! This is a perfect example of the book Buy-ology by Lindstrom…The casinos understand what makes you buy (visually, sound, smell). So, could a “healthy casino” survive in this town? It’s an interesting question. I would hypothesize that the two were diametrically opposed to one another since I’m sure there’s a correlation between alcohol consumed and money gambled (lost). Do the health conscious people come here? I would bet the gym utilization per room night is very low compared to other cities. One might imagine that reverse engineering the knowledge that the casinos have about driving lack of sleep, gambling, and other activities to figure out how to nudge people to be healthy. But, the other interesting study is just general conference behavior. Why do people come to conferences? I’ve been to three conferences this year, and I have yet to make it to a single session. For me, conferences are a centralized location to meet up with people. Rather than fly to a city for one meeting, I can fly to one location and have 10 meetings. It’s very efficient. We all want to get out of the hospital as quickly as possible. A recent study from JAMA that appeared in the WSJ showed that while days in the hospital dropped from 8.6 days in ’93-’94 to 6.4 days in ’05-’06 the readmission rate (within 30 days) went up from 17.3% to 20.1%. I’d love to see the economics around this. Do the hospitals make more money in this case? Do the plans save more money? “From a societal point of view, dollars spent on health care likely increased.” Harlan Krumholz, Yale University cardiologist and senior author of the study. 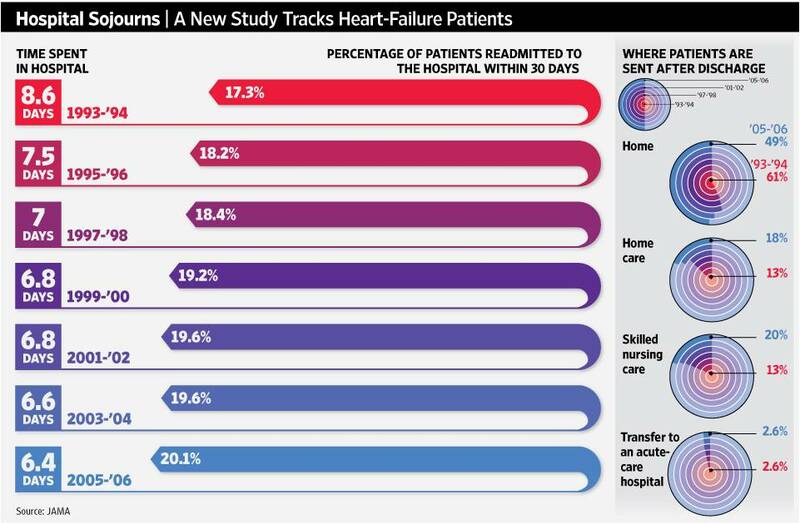 The study author echos a point that we [Silverlink] often make to our clients which is that hospitals (or payers) need to invest more effort and resources to make sure the transition to outpatient status in seamless. Do they understand what the doctor’s instructions were? Do they have someone caring for them? Did they pick up their medications? Another key lesson learned here is that it’s important to measure what matters and that what’s measured gets improved. I can’t believe it’s taken me a few weeks to catch up on my notes from a conference call with David Snow and Dr. Rob Epstein from Medco Health Solutions about their 2010 Drug Trend Report. I captured some of Dr. Epstein’s comments in a quick blog post, but I have a lot of respect for David Snow and wanted to capture a few of his comments here and pull out some of the interesting data from the Drug Trend Report. Reform has to address all three legs of the stool – Access, Quality, and Cost. Right now, it’s focused on access. 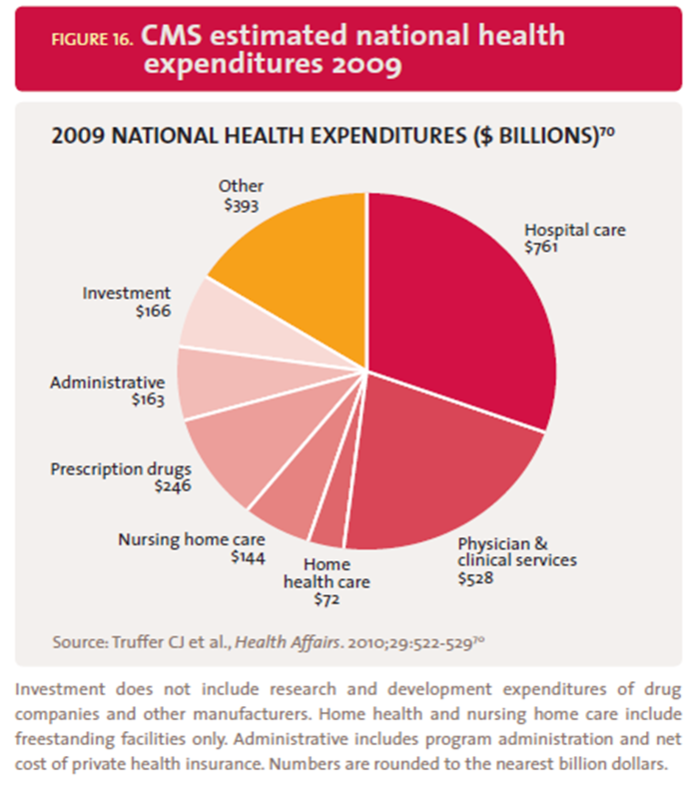 Of the $2.4T we spend in the US on healthcare, $1T of it was unproductive. One of the big issues in the system is poorly designed systems for the people that deliver care. Pharmacy is ahead of the curve since it’s already wired and uses evidence-based care. We have to focus on the chronic conditions. 96% of the pharmacy spend and 75% of the medical spend is here. $350B of the waste is due to poor management of chronic solutions. We still have to address medical liability and defensive medicine. The pathway to biosimilars is very fair to the innovator. Class competition in specialty is increasing. His most interesting comment which I’ll repeat from my earlier post was that if the FDA really understood true adherence they might make different decisions on approving drugs whose effect is tied to a person staying on a medication over time. Mail order penetration was 34.2% (which I believe is industry leading for the PBM sector with only Walgreens showing a 90-day utilization number that’s higher). Reported trends are based on 2 years’ data on pharmaceutical spending. Drug trend percent includes 201 clients representing approximately 65% of consolidated drug spending. The sample comprises clients who offer integrated (mail-order and retail) pharmacy benefit options for members. Clients with membership enrollment changes > 50% were excluded from the analysis. Plan spending is reported on a per-eligible per-month (PEPM) basis, unless otherwise specified. An “eligible” is a household, which may include multiple members who are covered under the same plan. Plan spending comprises the net cost to plan sponsors less discounts, rebates, subsidies, and member cost share. Generic dispensing rates and mail-order penetration rates represent the total consolidated Medco client base. Diabetes is obviously a critical category for everyone. I found it interesting that they saw fewer patients filing claims for diabetes but more drugs per patient in 2009. 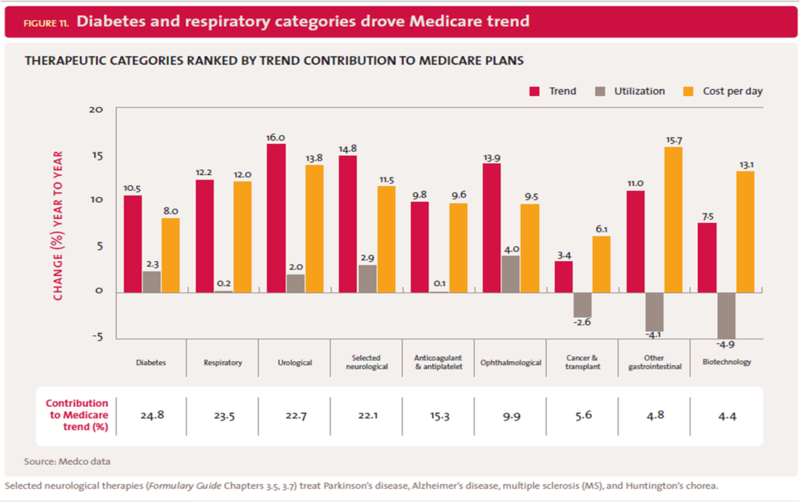 Respiratory therapies (driven by those <19 years old) jumped in contribution to trend from 8th to 2nd. Antiviral drugs (Formulary Guide Chapter 1.8) include oral treatments for HIV/AIDS, influenza, herpes, hepatitis C, hepatitis B, and injectable treatments for respiratory syncytial virus (RSV), and cytomegalovirus. Specialty drugs…I’m always surprised that all the PBMs still have to caveat the fact that they only adjudicate some of the claims since some specialty drugs are filled and billed under the medical benefit. That seems like something that should / could be fixed, but I know it’s been tried and is hard since people are making money off them being billed elsewhere. There are over 800 drugs in the pipeline. A high proportion of newly approved drugs are designated as specialty. Unique manufacturing processes make specialty drugs expensive to develop. Fewer drugs within a therapeutic category limit competition. There may be only one specialty treatment for an orphan condition. Few drugs are therapeutically equivalent to others in the category, reducing interchange and related cost savings opportunities. It is more difficult to transition existing patients from one specialty drug to another preferred specialty drug because often these drugs are large, unique proteins that are not considered interchangeable. Most small-molecule specialty drugs are relatively new with few generic alternatives. No defined approval pathway exists for follow-on biologics (also known as biosimilars). Drugs used to treat cancer represent a large portion of new drugs in both the pipeline and marketplace; most are specialty drugs and some can cost more than $20,000 for a 12-week therapy course. 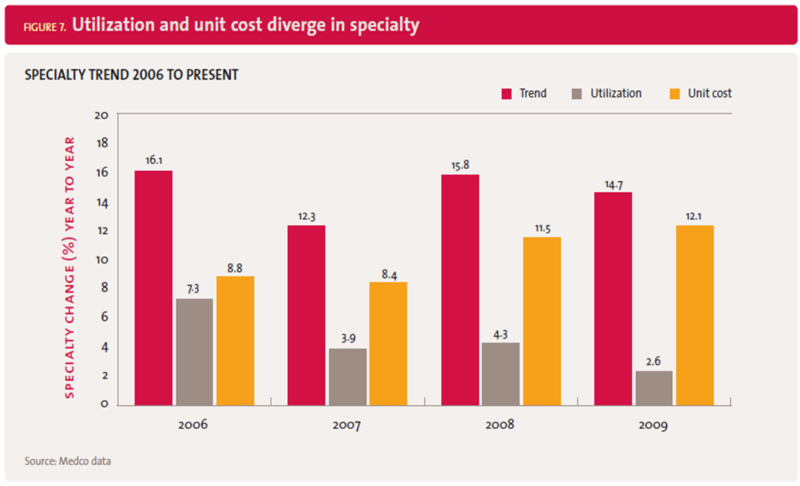 It was the first time I noticed anyone caveating the specialty trend. They proactively addressed different calculation methods to point out that their method yielded a 14.7% specialty trend, but if you did things differently (as I assume others must), then their trend would have been 12.1%. WelChol, Crestor—for low-density lipoprotein cholesterol (LDL-C) reduction in children aged 10 to 17 with heterozygous familial hypercholesterolemia. Atacand—for hypertension in children aged 1 to 17. Axert—for acute treatment of pediatric migraine. Protonix—for erosive esophagitis in patients aged 5+. Abilify—for irritability associated with autistic disorder in children aged 6 to 17. Seroquel—for schizophrenia in children aged 13 to 17, and for acute manic episodes in children aged 10 to 17 with bipolar I disorder. Zyprexa—for schizophrenia and for acute mania (bipolar I) in children aged 13 to 17. An interesting perspective that I’ve talked about many times (without the research capabilities to analyze) is the correlation between sleep and chronic disease. They looked at this across states based on drug utilization and found a correlation (not necessarily causation). 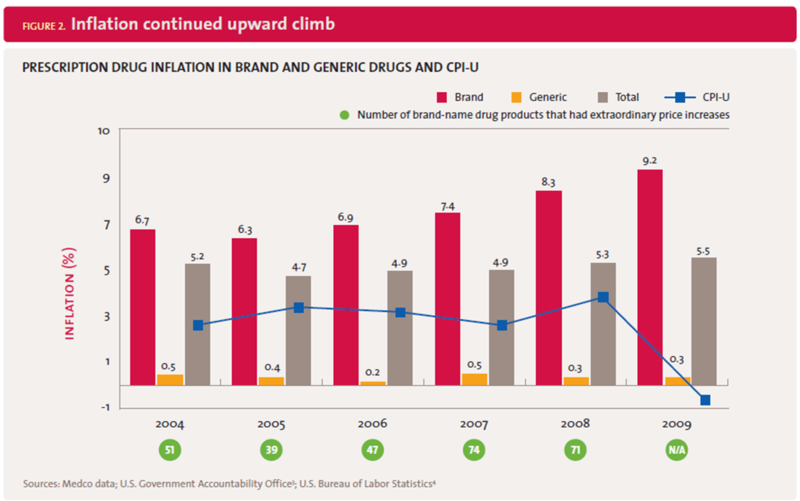 Continued inflation in brand drug prices. 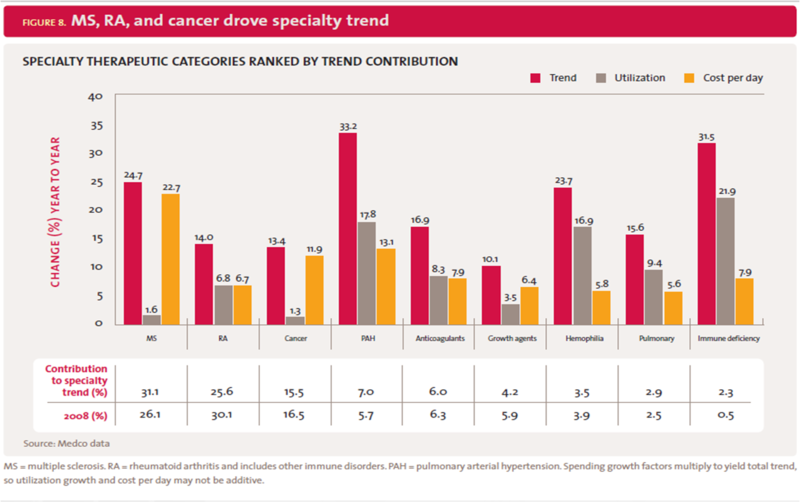 Majority of trend will come from specialty – oncology, orphan conditions. They talk a little about obesity although I would love to understand more about how a plan sponsor should manage this. Diabetic medical claims are forecasted to grow from $113B to $336B over the next 25 years. I’m not going to spend a lot of time on personalized medicine here. (A recent post of mine on this topic.) They’ve been very active in this space for years talking about it. I think one of their interesting points in the Drug Trend Report is how Comparative Effectiveness will dovetail with Personalized Medicine. Only 29% of patients treated for high cholesterol reach their cholesterol goal. They have a section on wiring healthcare which David Snow has talked about for a while. It’s a critical area to address and has lots of opportunity. They also talk about the concept of collaborative care (aka medical home…aka accountable care organizations). I’m a big believer that poly-pharmacy creates issues (as does poly-physician). I don’t hear much talk about it. I was glad to see them talk about a study they did which identified poly-pharmacy issues, talked to MDs, and ended up with 24% of cases where medications were changed. A Medco survey reported that 81% of participants with a new diagnosis, who received services at a traditional retail pharmacy, either did not receive counseling or were dissatisfied with the prescription drug counseling they received. When given the opportunity to speak with a Medco Specialist Pharmacist, 75% of these patients accepted the offer of immediate telephone support. I thought it was really interesting to see a screen shot of their application used by the TRCs to create their Health Action Plans for consumers. I was also interested in their focus on women’s health and some data on caregivers and the gender differences in healthcare. One of their TRCs is dedicated to addressing these differences. This was definitely the hot topic yesterday. I talked to lots of people about it. I had a chance to give it some more thought last night. A few things dawned on me. 1. Timing. This was timed well from a Walgreens perspective. 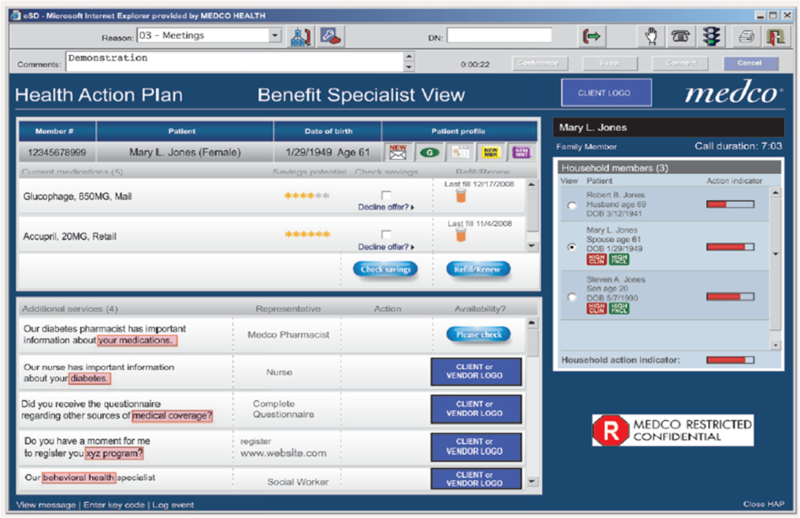 Managed Care RFPs are mostly over and employers are making their decisions now on PBM services. Managed Care would have been more likely to focus on the cost and understand how to mitigate the disruption. Employers will be much more sensitive to the disruption. That will be something that CVS Caremark will have to manage. 2. Who wins. Since one analyst told me that Walgreens represents only a single-digit of CVS Caremark’s revenue, the impact may not be huge. On the flip side, it’s likely some downside for Walgreens since they’ll stop serving some portion of CVS Caremark’s business. Consumers aren’t helped here. So, my only conclusion is that the other PBMs (i.e., Medco and Express Scripts) are best positioned to win from this if it causes any CVS Caremark PBM decisions to go their way. At a minimum, it creates FUD (fear, uncertainty, and doubt) which no sales person likes to have to deal with. 3. Validation. If I’m the product manager for Maintenance Choice at CVS Caremark, this seems like pretty strong validation that the offering works. As Adam Fein showed before, it does drive volume to their stores. Obviously, Walgreens was afraid of this taking off and having a larger impact on them. On the other hand, another response would be to look at the top 5 MSA (market service areas) where Walgreens is stronger than CVS. I’m guessing those are NY (post-Duane Reade acquisition), Delaware (post-Happy Harry’s acquisition), St. Louis (CVS just started operating here), and a few others. They could go into those markets and buy up independents or some smaller chains to immediately mitigate this. There are several responses short of just folding and putting Walgreens in the network. Ultimately, I think it’s about whether CVS and Walgreens see each other as “enemies” or just competitors. Do they want to grow the pie or do they want to put the other out of business (if such a thing were possible)? Personally, I’m a little surprised they didn’t limit it just to the Maintenance Choice contracts which is where they have issues (like Mandatory Mail). Walgreens has fought for years against PBMs that implement models that limit choice. I guess one of the big questions here is whether CVS Caremark allows Walgreens into their Maintenance Choice network. Walgreens (for example) has multiple 90-day networks. One which is just with Walgreens and one that includes other retailers. 1. Will CVS Caremark pull out of the Walgreen’s PBM network or their 90-day networks? 2. Will other retailers pull out of the CVS network? 3. Will Walgreens be more aggressive with other PBMs or can they only “fight” one at a time? 4. Will this help CVS Caremark focus their retail acquisition strategy to areas where Walgreens is stronger than them really creating a retail battle and less of a PBM battle? I’m sure in some geographies (e.g., St. Louis, NYC) this may present some challenges where the CVS presence is not as strong, but in the end, most consumers have access to more retail pharmacies than they need and most PBM decisions are heavily influenced by price. If CVS Caremark can offer a price point that takes into account the disruption to the member base of not having Walgreens in the network, they can win. If that hurts them too much or they can’t do it, they’ll have to figure out how to make nice with Walgreens. Do You Brush Your Teeth With Toilet Water? While I hope not intentionally, this is a discusting reality for most of the world. Since most people flush with the lid up, the germs spread all over your bathroom. (One of the reason I hate those public toilets that auto-flush and cover you in germs all the time.) Here’s a good article on this along with a slightly humorous video below. * Don’t wear your shoes in the house and don’t store them in your closet. * Don’t move hot food to the fridge to quickly or you’ll create a ripe environment for bacteria to grow. * Don’t use the middle stall of a public bathroom. * Don’t store your medicines in your bathroom. * Don’t put your purse down on places you eat off. Nasty stuff on the bottom of those purses. * Don’t use headphones in public areas with lots of background noise…you’ll turn the volume up so loud that you’ll damage your ears. You can call the framework whatever you want but forcing people to chose an option works. I think Organ Donations are a great thing and the data is out there to show what states should do to encourage this. In Colorado, 64% of driver’s license and State ID applicants signed up as donors. In Michigan and NY, less than 13% did. The 8 states who have rates in exceess of 50% all do the same thing…the employees at the motor vehicles department ask the people and force them to say yes or no. Apparently there are some people pushing for “presumed consent” which would require that people opt-out. This is apparently done in several European nations, and while I don’t have an issue with it personally, I’m sure it won’t happen here. This framework reminds me of the Select Home Delivery option which Express Scripts designed a few years ago, and I believe is the best product idea to come out of the Consumerology concept. This seems to be one of the more successful texting programs in the healthcare space. This public-private partnership with sponsors like J&J and Pfizer is leveraging texting technology to try to address the US infant mortality rate (with is 30th worldwide). With 25% of people not having a landline and more and more people (especially younger generations) depending upon the mobile phone, this makes a lot of sense. In general, the sick population for the healthcare companies are not the younger generations, but this is typically different for pregnancy. What I didn’t know until reading an article about this is that Hispanics and African Americans are 2.5x as likely at Whites to put off prenatal care until the 3rd trimester or skip it altogether. So what do you do? Text BABY (or BEBE) to 511411 and punch in your due date. Who writes the content? The National Healthy Mothers, Healthy Babies Coalition. Is there a charge? No. What is the content? You get up to 3 texts a week until the baby’s first birthday. They talk about seeing their doctor. Keeping their appointments. Get immunizations. Put babies on their backs to sleep. What do they hope to learn? Will users have different outcomes? Will they go to more appointments? Will they stop smoking? Will the incidents of low birth weight and pre-maturity decline? There was an article last month in Time (5/3/10) that caught my eye titled “The Long-Term Effects of Spanking“. I’ve never been a big fan of spanking, but I don’t have any issues with it either. I was spanked a few times as a kid, but it was the exception not the rule. I was surprised in another article to see that 22 states still allow spanking in schools. I would have an issue with that. This article talks about a Tulane study published in Pediatrics magazine which says that children that are spanked may act out more in the long run. Those who were spanked at age 3 were much more likely to be aggressive at age 5. Apparently, this was the first study to control for issues such as depression, alcohol and drug abuse, spousal abuse, and whether the mother considered abortion. (All factors which apparently contribute to a child’s aggressive behavior.) Controlling for those, spanking still was a strong predictor. These children who had been spanked were more likely to be defiant, demand immediate satisfaction of their wants and needs, become frustrated easily, have temper tantrums and lash out physically against other people or animals. The American Academy of Pediatrics (AAP) does not endorse spanking under any circumstances. They recommend time-outs which typically involve denying the child any interaction, positive or negative, for a specified period of time. Any interesting discussion topic and one that for many us probably demonstrates the shifting winds of our culture. I don’t think I’ve ever discussed this with my pediatrician. I guess I know what her answer would be. One of the big ways that retail pharmacies make money is off their front end sales. Now, a significant portion of those sales are the things that make us obese (candy, snack food, soda, ice cream, tobacco) which ultimately leads to many other conditions (diabetes, hypertension). So, I guess the question is whether these places can play both sides. [And, I’ll give the credit to Adam Fein for asking this question at a meeting last week.] Can they sell us the convenient goods that we would buy anyways in a 24×7 easily accessible location AND become a health destination? On the one hand, they have all the assets – pharmacy, clinics, medical supplies, vitamins, health professionals, data, etc. – that we need to manage our health. On the other hand, they enable us to easily be unhealthy. Should they care? Should they be like the soda companies who voluntarily removed soda from schools? Or should they be smart business people and just capitalize on people’s wants? It’s an interesting question. What do you think?